Finally recovered from a few harrowing weeks of exams and the flu, it is time to show you a recent finish before I throw myself back into Christmas gift sewing. Just over a week ago, in a flurry of exam stress, I dug out a project that I cut out back in August for a quick study break. A couple of relaxing hours later, I had a finished bag made using Guy Latulippe's killer Simple Satchel pattern in the small size. I really love Guy's patterns. This is my second (my duffle being the first). They are simple to make but you're left with a finished product that could easily be passed off as something you bought in a chic boutique. 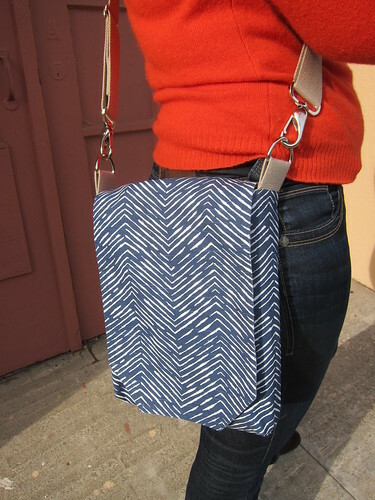 I used a gorgeous navy herringbone print that I bought when Kelsey and I were in Seattle together for the bag exterior. It's home dec weight which makes it perfect for a nice and sturdy satchel. Some of the leftover Indian Summer fabric from my Eucalypt tank was a perfect match for the lining. I ended up adding some lightweight interfacing to the bag to give it a little more structure but otherwise, followed the pattern exactly. The pattern was great and although my sleep deprived quilter's brain couldn't process the three dimensional bag instructions when I first read through them, they were crystal clear when I actually started sewing. I am beyond tickled at how well the exterior print lined up across the seams. I made a half-hearted attempt to fussy cut as I was going along but this level of accuracy is the product of sheer luck. 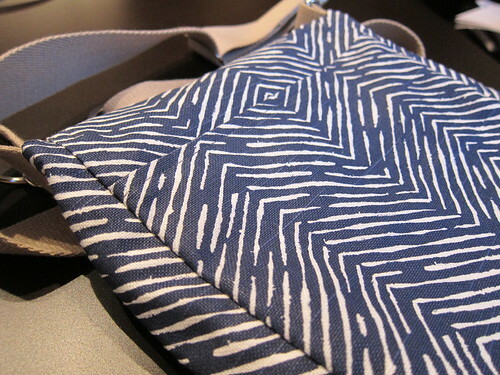 This bag is a perfect size, it will comfortably hold an iPad or a book, a wallet, keys and some lip balm. 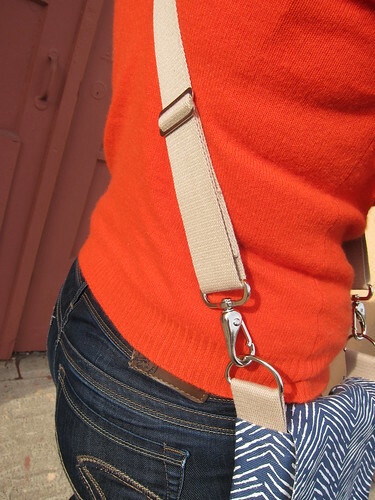 The ADJUSTABLE cross body strap makes it the ideal thing to use when I'm running errands on my bike. This was my first time using bag hardware and it really adds a nice touch. I bought mine from a wholesaler called UMX after I couldn't find anything big enough locally. I bought enough hardware for three bags when I ordered so you can bet that there will be more of these in my future. I love it! Beautiful finish. Love it Amanda! You finished it all so nicely, especially with all of that hardware. This is a really nice bag Amanda - you're right, it definitely looks like something you could have bought in a lovely shop. 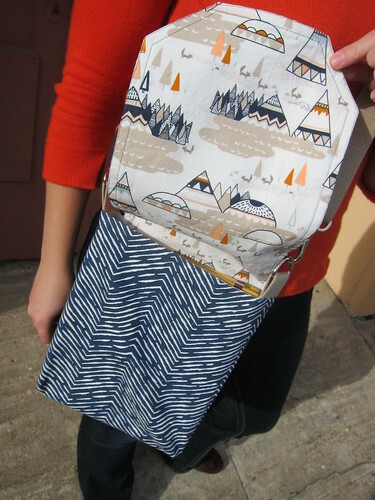 I know sometimes handmade is the look to go for, but with bags, I think "just like a bought one" is a great compliment. I love when prints line up out of sheer luck too! Thank you for linking to Guy Latulippe's patterns. I had seen your duffle, and then I think the Make Something blog had also posted his duffle made up? Maybe? so I have been covetous but not clear on where to buy one of his patterns. Now nothing will stop me! What a cute bag. It looks so useful, just the right size. And in that navy print it will go with everything. A great pre-Christmas finish! Love this Amanda! I would totally buy this in a high end shop! It's gorgeous! And the Indian Summer print on the inside... well, we all know how deep my love goes for this fabric line!